Action Packed Paintball Games is the Minneapolis/Twin Cities choice destination for paintball enthusiasts ready to dominate the field. Paintball is a heart-pounding, battle strategy game, devised of two or more teams. Each player will be armed with an air-compressed rifle loaded with a cartridge of paintballs to decimate your target with. Nail your opponent with a well-aimed shot and lead your team to victory until no enemies remain. Our vast outdoor park offers a variety of different battle scenarios from defending your fortress, to civil war reenactments. Whatever your adrenaline craves, our paintball retailer has it for you. Here at Action Packed Paintball Games, we are prepared to provide our games to groups up to 150 players desiring the ultimate showdown. 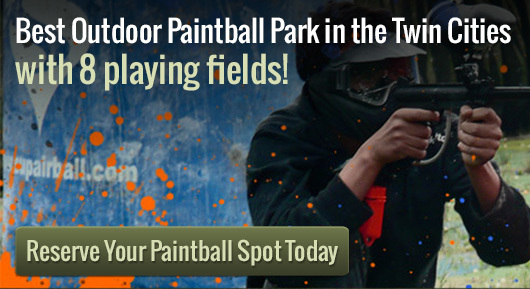 Open dusk to dawn, 7 days a week, our paintball retailer offers affordable reservation prices for groups. Each reservation includes a party host acting as your game’s referee, and ALL DAY game play. Your party can choose to battle in the morning, dine in our outdoor grill area during cease-fire, and get revenge in the afternoon. Solo walk-ons looking to test their skills are welcomed on the weekends between 12 P.M. and 5 P.M.
Due to the exciting nature of the game, Action Packed Paintball Games takes pride in our attention to the safety of our customers. Each reservation includes a safety orientation meeting, and all participants are required to wear safety-regulated headgear. Contact us at 952-492-6776 to make your reservation today!